If you run SAP web applications in your company, you typically have to deal with different SAP products, product versions, and different user interface technologies. On the other hand, the end user uses one, two or three different company browsers on his desktop and uses one or two different tablet or smartphone devices together with the SAP web applications. SAP´s UI technologies for web application support in general desktop browsers from major browser vendors, like Google Chrome, Safari, Firefox, Microsoft Edge and Internet Explorer 11 on major client platforms like Windows and macOS. A web browser for a specified client platform is called “web browser platform”. The summary of all supported web browser platforms for specified product version and SPS is called “Web Browser Support Matrix” and is for the on-premise case published in SAP´s Product Availability Matrix (PAM). 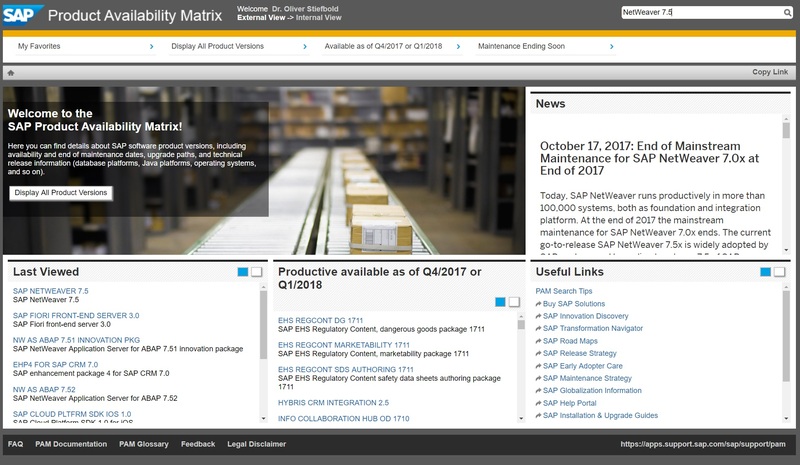 SAP publishes the PAM information about SAP software releases: release types, maintenance duration, planned availability, and upgrade paths. The PAM also offers information about supported database platforms, operating systems and web browser platforms. So how do you find web browser information for a specific product? Select the entry “EHP8 for SAP ERP 6.0” and you will get the product detail screen. First look always at the “Essential Information” cell (click “Open in New Window”). It contains in that case database information and no web browser information. Go to “General Information” –> “Related Product Versions” and check the “Required Product Versions”. It shows your NetWeaver version for your ERP. typically you run EHP8 on NetWeaver 7.5. We will need this later. Go to “Technical Release Information” –> “Web Browser Platforms”. Choose as “Product Instance” (a product instance is part of a product version and must be installed and updated as a whole on a single technical system) “Central Applications”. Central applications is what you need typically always and contain the NetWeaver AS ABAP 7.5. Choose a “Scope”. You can choose the Software Components “SAP BASIS 7.50” or one of the “User Interface Technology” SC versions, e.g. 7.50, which contain the SAPUI5 library. As a result, you get information about supported browser platforms, until when this Software Component Version is supported and may require an update and links to the browser and release notes, which contain further information. As you can see also, browser support for ERP central applications is in general determined by the NetWeaver AS ABAP version used. The information you get is aggregated for the Software Component, in which the SAP UI technology is shipped. This means that the SAP PAM can only show an aggregated view of web browser support for one software component and for one browser in general, not for a dedicated UI technology. To overcome this, we provide detailed information in the PAM of SAP NetWeaver. For detailed information, you need to know the version of your underlying SAP NetWeaver application server and the version of your SAP_UI component which can be different from the AS ABAP. Go to SAP PAM and type “SAP NetWeaver” in the “Find Product Versions” search field and choose your version (e.g. SAP NetWeaver 7.5. For NW 7.51 and 7.51 there is no complete NetWeaver stack available. Choose AS ABAP 7.51 or 7.52 instead). Open “Essential Information” slide deck. It contains a link to the web browser information slide deck. Open it. The Web browser support slide deck contains the most important general information about specific browsers, about browser support in general and the detailed browser support matrix for the NetWeaver UI technologies with required minimum support package stack. The web browser information for SAP S/4HANA 1809 is directly contained und “Essential Information” (link). If you want to run SAP Fiori Apps on SAP Business Suite or S/4HANA, you need an SAP Fiori Frontend Server. The PAM Overview Page for this product version contains a browser support link under “Related Links”. Each web browser has generic capabilities (things it can do), restrictions (things it can´t do), different supported operating systems (platforms) and a specific release strategy and life cycle, which might or influences the operation with SAP web applications. For browser-specific releases notes, see section “References” at the end of the blog. Each technology has generic capabilities and restrictions. E.g. SAPUI5 supports a defined set of mobile devices (reference devices), other UI technologies typically don´t. For ui technology-specific releases notes, see section “References” at the end of the blog. In general, the UI technology determines the browser support of the SAP web application. However, browser support for individual SAP web applications of S/4HANA, ERP, Fiori or others might vary from UI technology information. For example, SAPUI5 supports, in general, all three form factors: Desktop, tablet and phone. SAPUI5 based Fiori applications may support based on the design of the application only desktop browsers, desktop and tablets or desktop, tablets and phones. For Fiori apps, you find this information including links to further apps specific release notes in the SAP Fiori Apps reference library. For other web applications, such as from the SAP Business Suite, you may check the release notes of the applications. If possible, SAP recommends that customers support at least two alternative web browsers as “company browsers”. In general, there is not a convenient way to switch back to a previous browser version if a new browser update or patched version contains incompatible changes, which in rare cases, may cause rendering issues. In addition, preventing browser updates may not be the desired approach. In case of technical issues, the recommended alternative browsers can function as a backup and may open strategic alternatives for the supported client platforms. Support of Web Browser Browser Platforms ends latest with the end of support of the Web Browser platform by the Vendor.